Southwestern Connecticut’s proximity to New York City, and its historic cities and villages, coastline, and natural beauty have long attracted people and businesses. During the late 20th century, Connecticut became the headquarters of many large corporations, and was renowned for its excellent suburban schools, strong industrial base, and high quality of life. While cities like New Haven and Bridgeport lost jobs and population, the rest of the state prospered with the highest per-capita income in the nation. But over the last decade, many of the forces that propelled Connecticut’s economy now pose challenges to its future success. Fortune 500 companies are no longer clamoring for space in auto-dependent suburban office parks, preferring vibrant cities instead. 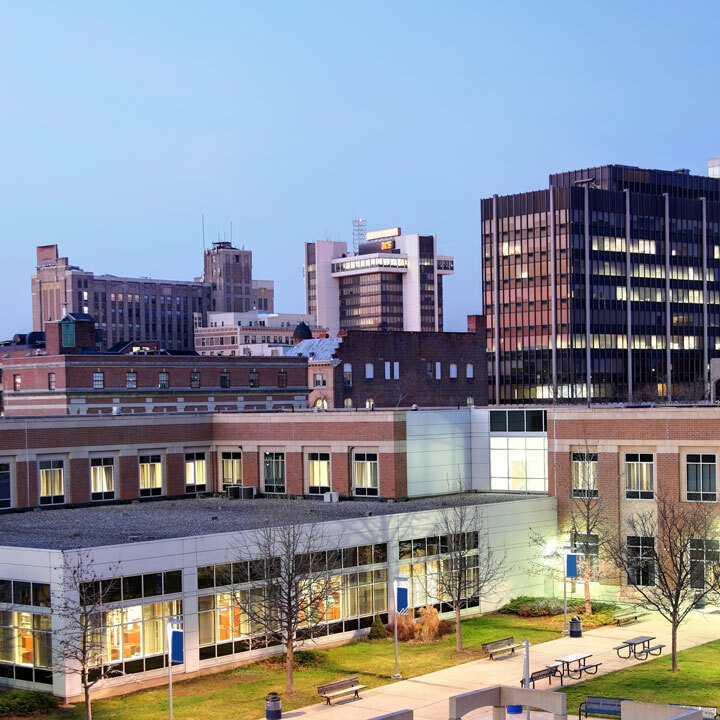 While some Connecticut cities like Stamford are attracting new businesses and talented workers, others continue to struggle after decades of disinvestment and industrial downsizing. Meanwhile, public schools are suffering due to insufficient resources. In many prosperous suburban areas with good schools, residents are resisting multifamily or affordable housing. Some are resistant to any commercial activities. Connecticut relies heavily on its roadway infrastructure, much of which is congested and in poor condition. Yet it is the only state in the region without highway tolls. Metro-North is chronically underfunded, and service is deteriorating. Coastal communities are vulnerable to storms, flooding, and sea-level rise due to climate change. And while significant investments are being made to increase resilience, municipal efforts to plan and adapt remain uncoordinated. Connecticut has been slow to capitalize on the increased demand for walkable downtowns and neighborhoods by allowing for more multifamily homes and mixed-use development. Aligning local land-use and statewide economic development strategies is difficult. And without county-level government or strong state-level planning capacity, cross-jurisdictional coordination is weak. The state has also invested relatively little in new infrastructure. The Fourth Regional Plan proposes actions that would help Connecticut build more affordable housing in all communities, capitalize on mixed-use, mixed-income downtowns, and invest in a reliable transportation system. The recommendations in the Fourth Plan would help mitigate the impact of a changing climate, improve health by reducing pollution and promoting physical activity, and reduce long-standing racial and economic inequality. Proposed investments in Metro-North’s New Haven Line would improve inter-city service, reduce travel travel time between regional hubs in Connecticut, and provide a direct connection to New York City. Connecting commuter rail into an integrated regional rail system would give Connecticut cities better access to destinations throughout the tri-state area. More inclusive local planning would create dynamic communities with greater housing choice and economic opportunities. State incentives would foster more walkable communities, and bring work and recreational opportunities closer to where people live. On a state and regional level, investments and zoning changes would increase rental and affordable housing options, reduce housing costs, and encourage economic growth. The plan encourages partnerships between municipalities, local residents, and anchor institutions, such as hospitals and universities, to increase capital and human resource investments. These institutions are often a community’s largest employer, and partnerships with local government and neighborhoods can create added value through local hiring and purchasing, as well as housing and infrastructure investments. Curbing an overreliance on property taxes to fund local services would reduce inequities between rich and poor communities, enhance housing production, and reduce sprawl. This can be achieved if the state government assumes a larger share of local school budgets, increases incentives for shared services, and encourages municipalities to diversify sources of revenue (with income taxes or sales taxes) or more innovative property tax structures. Providing resources, incentives, and guidelines for school districts to consolidate and share programs and services would reduce costs, as well as disparities between urban and suburban school districts that undermine equal opportunity and workforce skills. A regional coastal commission and state adaptation fund would help communities prepare for rising seas and more intense storms more effectively, and promote green infrastructure in cities.